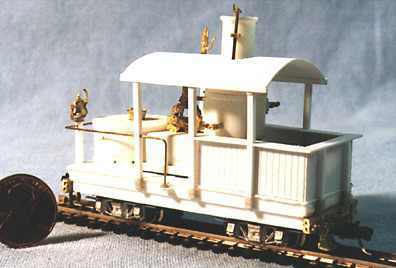 An Arnold N-scale S-2 provides the motive power. 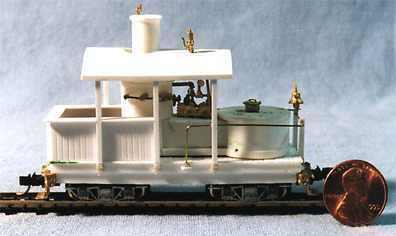 This is based on and scaled from pictures of a NorthWest Short Line model, long out of stock. The order blank for this kit, and other items, can be found here. These are plans in .gif format for a free-lanced HOn30 Class A Climax. To see plans in .pdf format, choose this link. The pictures below are of the finished frame, with hand-turned/milled boiler and water tank. 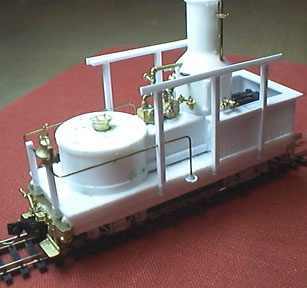 I now have the boiler, water tank and frame as a kit to fit a modified Arnold S2 (or similar) chassis. Sorry for the picture quality, but this is a quick and dirty digital photo, not a 35 mm with closeup lenses. The disk-shaped copper object is a US penny (7.5 mm diameter). This is a craftsman kit, with a lot of individual work to do on your own, but it looks super. Note there will be not as much cutting of the Arnold chassis as it looks like above - I was planning something else when I changed horses in mid-stream. 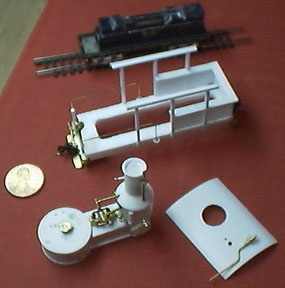 I have finished the molds, and begun casting the parts for the HOn30 Class A Climax kit. First off some comments and observations, then pricing and availability. Please see this link for information and a free simple plan. The castings are pretty good, they are white plastic. 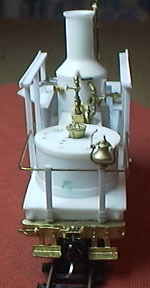 I decided to cast the boiler in 2 parts, so if you want to make your own lower part, you can. Note that this is a craftsman kit - with a lot of additional work to do, and detail parts to buy,. 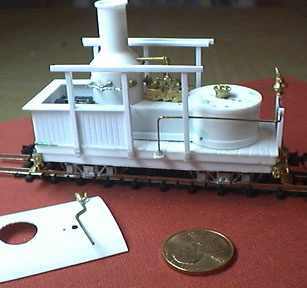 The kit is sized to fit an Arnold S2, but almost any N gauge loco that fits the drawing on the page above should work. Also note that if you can re-gauge the loco to HOn3, you can make an HOn3 Class A Climax. 1) Castings - 1 water tank - properly milled out as per my plans above; 1 boiler top; 1 boiler bottom with water sight glass and hatch; 1 wooden deck frame with nut & bolt castings on the ends. 2) Additional detail parts list, to help you finish your Climax. 3) Award-winning, superbly-detailed instructions (far more complete than the single Web page) with construction tips. 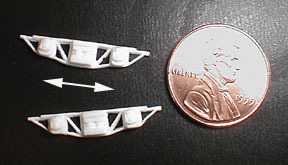 4) Sideframes are now included in the kit; you can use these or pick from the included parts list. These are available as a separate item (see way below). The distance between the arrowheads is 0.53 inches, 13.5 mm, or 4 feet in HO scale. 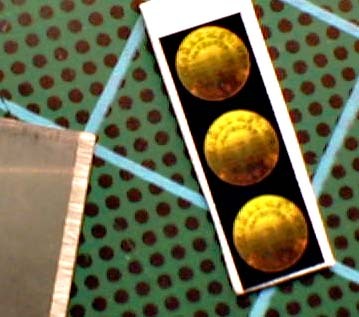 5) New - color Climax builder's plates are included in the kit as well. That shiny thing to the left of the builder's plates is the edge of a razor blade. Complete HOn3/HOn30 Class A Climax kit is $38.00; Connecticut residents must add 6% sales tax. Please include $2.00 for regular "snail-mail" shipping to US, Canada, Puerto Rico, U.S. Virgin Islands, Mexico and APO/FPO addresses in the U.S. If you want Priority Mail it's $3.50 additional. For those in other countries, please contact me privately at mail@mrollins.com to discuss payment and shipping. Set of 4 HO scale Climax sideframes is $7.00; Connecticut residents must add 6% sales tax. Please include $3.00 for regular "snail-mail" shipping to US, Canada, Puerto Rico, U.S. Virgin Islands, Mexico and APO/FPO addresses in the U.S. If you want Priority Mail it's $5.50. For those in other countries, please contact me privately at mail@mrollins.com to discuss payment and shipping. or you can use the handy order blank. Note for credit card orders this kit is carried by the fine folks at B & F Hobby Shop, Bakersfield, CA. You can e-mail them or view their Website. Likewise UK customers can visit Pepper7, or e-mail them. 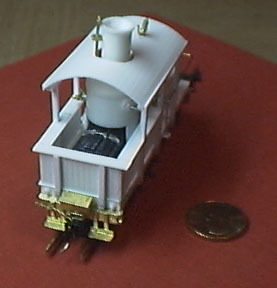 The following pictures show the unpainted model as built from the kit. Note for those who have purchased the kit, I have added a bell in the front, as well as a toolbox in the back and some funky coupler lift bars from East Broad Top, part # EBT UL-1. Also note how well the Arnold loco mechanism is hidden from view: a wood load in the bunker opposite from the water tank will complete the illusion. 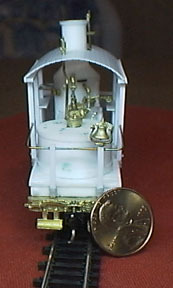 Shown below are some photos that illustrate the construction behind this model. Finished Climax, painted with bell and whistle ropes added. To see some information on real Climaxs, look here.